A warm and kindly appreciative crowd (...we hear it was a large crowd!...) at the performance of two crankies: one based on the Old Time song "Little Birdie" and one using unique characters of wood type from the collection at the Estonian Paper and Print Museum. Progress on project in Tartu…. Me working at the historic press at the Estonian Paper and Print Museum, Tartu. Can't say enough great things about the students + Pavel + Sonja + Svetlana + Vincent, all at South Ural State University in Chelyabinsk Russia. Everyone was so very kind to us. Warm hugz. + for more great photos….. 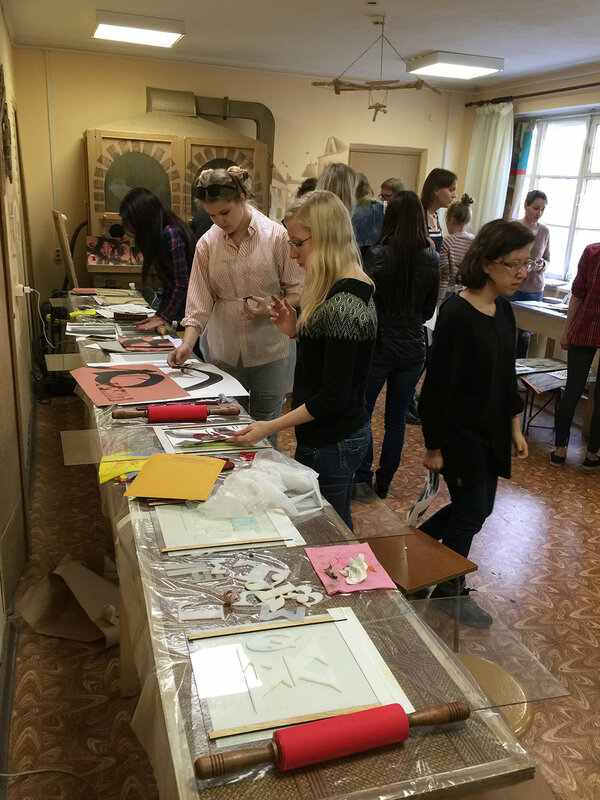 Teaching a letterpress workshop at the Serebro Nabora Typography Conference, Moscow, Russia. What a great experience. September 2016. Taught an Experimental Letterpress Workshop with my friend Jeff Pulaski associated with the Face Forward Conference in Dublin, Ireland in December. 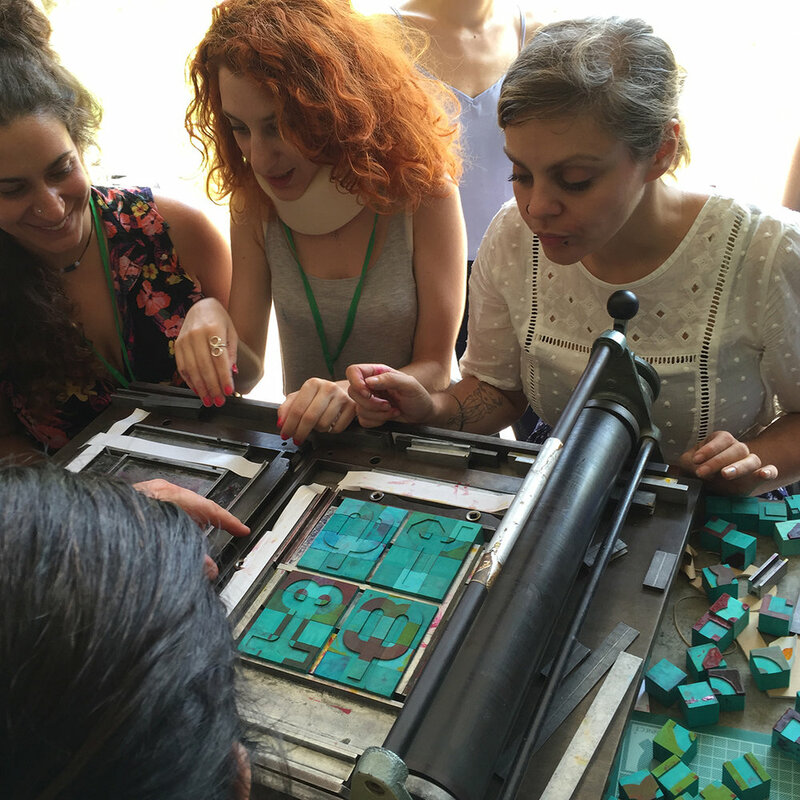 The workshop was at The National Print Museum and featured a very eclectic group of students from Russia, Mexico, Hong Kong, Germany, USA & Ireland. Everybody created enough prints to have a print exchange between all members of the group and we created a folio to hold it all with "Face Forward" cut in wood and printed letterpress on the Vandercook from my custom calligraphy. Big shout-out to Carla Merriman, Mary Plunkett, and the crew at the Print Museum and Mary Ann Bolger and Claire Bell who organized the conference. laser cutting my lettering in wood for future letterpress printing, printing and color experiments….. Spent several very productive weeks in May in Venice, Italy as a resident artist at the Scuola Internazionale di Grafica. 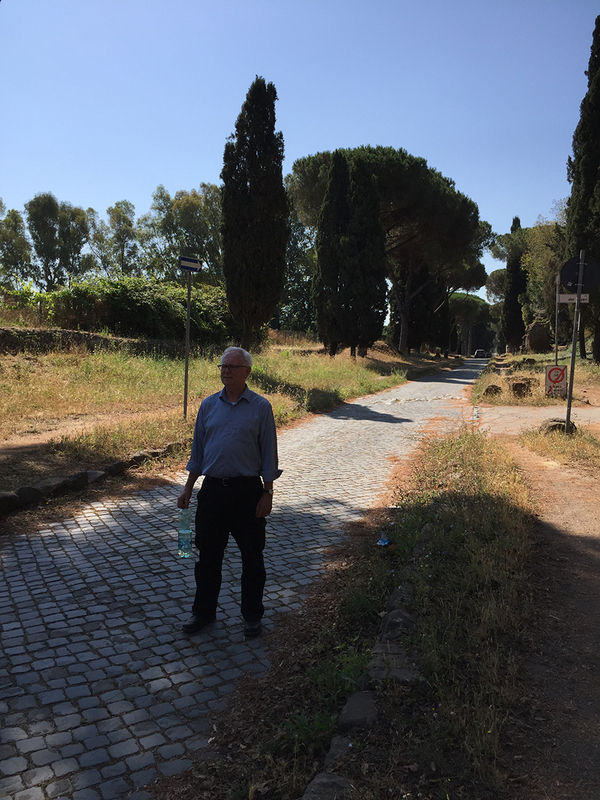 Mille grazie Lorenzo di Castro, Deirdre Kelly and Kathy! Especially enjoyed meeting Jeff Abshear, Director of Kalamazoo Book Arts Center [http://kalbookarts.org] , Paul Brown, Indiana University, and Anne Bush, University of Hawaii. While in Italy also visited the fantastic Tipoteca Italiana, Cornuda and the Bodoni Museum, Parma.